Deltadromeus is now thought to be a noasaur, off the abelisaur family tree. From Africa, it's another really big theropod around 40 feet. But this one is differnent, it's very gracile, built for running. The head is based off of the other known noasaur species and might be incorrect, it's a best guess at this point. You know that the abelisaur group Deltadromeus is currently in is Noasauridae, right? 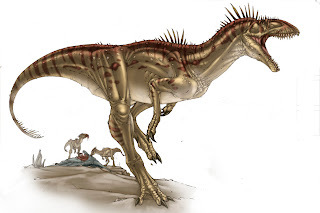 They're the long armed offshoot and are generally much smaller than the typical abelisaurid. Deltadromeus is really a scaled up model of these kinds of beasties. Anyway, nice drawing. Deltadromeus is one of my favorites. "Deltadromeus is now thought to be a noasaur, off the abelisaur family tree"
Wow, great picture! Love the spikes on the crest of the neck!